Niagol Stoyanov endured a worrying start to his time in Minsk when the Italian player missed the opening day of the qualification tournament due to flight problems, but back-to-back successes on the second day of qualifying put Stoyanov into the main draw. 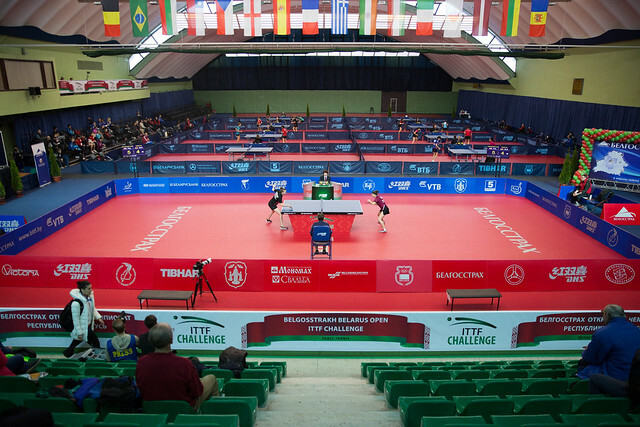 Awaiting Niagol Stoyanov in the top half of the Men’s Singles draw was Turkey’s Li Ahmet, who was seeded fourth for the competition and against the odds the unseeded Italian participant progressed from the tie without dropping a game. “Due to a change in the flights schedule I failed to arrive in Minsk on the first day of qualifications. Despite this, I won two matches in the group and got to the main draw. In the game with Li Ahmet I played steadily, and I may say that the qualification matches helped me to draw into the game”, Niagol Stoyanov. French players enjoyed a strong start to their main draw campaigns, with all three of the country’s contestants moving through to the Round of 32. Antoine Hachard, who is seeded 10th, recovered from a game down to beat Poland’s Kamil Nalepa (6-11, 11-8, 11-5, 16-14, 11-9), while Irvin Bertrand saw off Kiril Popov of Bulgaria in straight games (11-6, 11-6, 11-6, 11-4). The third French representative to succeed was the no.14 seed Enzo Angles, although it didn’t prove to be a straightforward task as he was pushed the full distance by Polish athlete Marek Badowski (4-11, 11-8, 13-11, 11-5, 8-11, 8-11, 11-5) in a seven game thriller. Denis Ivonin picked up a big win in the Round of 64 beating the no.9 seed from Ukraine Yaroslav Zhmudenko, however, the Russian contestant came close to missing out on his opportunity for victory in the tie. The opening three ends of the encounter were edged by a two point margin in Denis Ivonin’s favour, but a determined showing from Yaroslav Zhmudenko saw the Ukraine player pull himself back into the match with three consecutive game wins of his own. Momentum was against Ivonin but the Russian held his nerve, and his capture of game seven proved enough to book his spot in the last 32 (11-9, 11-9, 11-9, 12-14, 8-11, 7-11, 11-7). “I understand that I’ve given my all in this match. After the three games… I started feeling less confident, but didn’t break and found the power to finish the game in my favour in game seven. It’s true that I don’t have enough experience to play in tournaments of such level, so the main goal for me now is to learn something new, master my skills and play with the participants of these competitions, although the desire to get as far as I can is present as well”, Denis Ivonin.